In the June 2011 issue of Reason Magazine (Free Minds and Free Markets!) 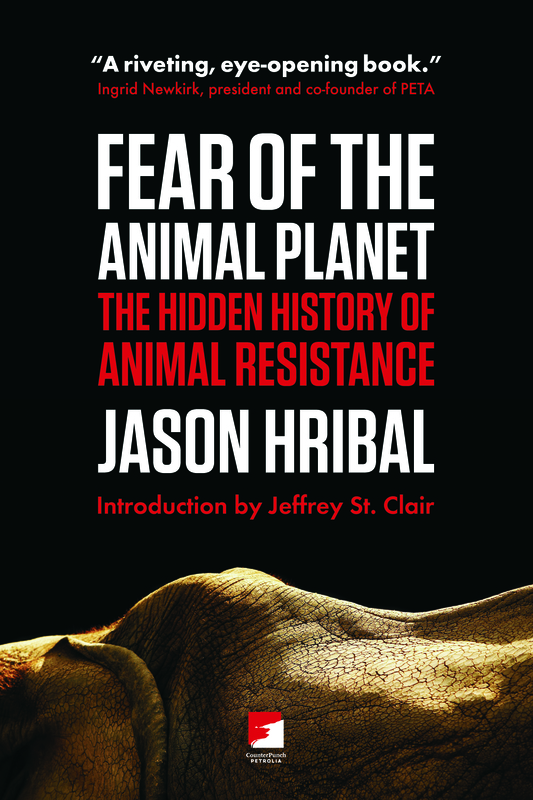 Thaddeus Russell had a lot to say about Jason Hribal’s Fear of the Animal Planet. His article, Ventriloquists for the Powerless, starts off with a bang. And here is Jason’s response, which ran on Counterpunch.org on June 27th. Make sure to check out the original post here. There are numerous social contracts that exist in today’s society. According to the historian Thaddeus Russell in his recent review in Reason Magazine (May 2011), I broke two with the publication of my book Fear of the Animal Planet. The first of those contracts has to do with class. The second has to do with species and class. Both are interesting points and needing of consideration. To the first point, Russell wastes no time in reaching it. By the second sentence, he calls me “an obscure semi-academic” and my publisher “tiny and idiosyncratic.” Russell carries on through the rest of the review with a general tone of derision. No attempt is made to hide his distaste of the ideas that I use. While some might be put off by such curtness, I find it refreshing and instructive. For the issue at hand is made very clear to me, this is about socioeconomic class and the ways in which it manifests itself. In other words, Russell is teaching me a lesson in class relations. It has not been my first time. My initiation into the working class was given in the summer before the start of 5th grade. I had been sent to a camp by my then step-mother. It was run by a large Evangelical church. I was not member of the church and my experience in theological matters consisted of one-year spent at Christian Life Elementary School in Rockford, IL. Nevertheless I would do my best to fit in at the camp and the other attendees were, at least on the surface, friendly enough. The days were spent intermixed with playful activities and bible study. Near the end of our stay, an exam was given. It was comprehensive, serious, and tested our knowledge of the New Testament. The head pastor’s son would go on to score the highest mark and he received numerous accolades for doing so on our final night together. This seemed to everyone as expected. He should have won. The unexpected came the following morning. With the parents arriving to pick up their children for the return homeward, the truth was told to me privately. I had tied for the top mark on the exam. The church elders, however, had apparently felt it necessary to conceal this fact. They believed that I neither deserved recognition nor the award. The reasons behinds their judgment were not supplied. But I was old enough to figure it out on my own. I was not a pastor’s son. The next lesson happened in high school. I attended Dakota High School in rural NW Illinois. The student body was quite limited in number, comprised mainly of kids from small farms and villages. On the outskirts of the district, there was Lake Summerset. This private, gated community contained a comparable wealth and it stood out. Its members carried themselves differently—with a certain level of arrogance and aloofness. In my high school, this disparity in wealth meant a disparity in treatment ranging from noticeable to stark. Encouragement, attention, and advanced coursework were lavished on the few. These students needed to be prepared for college. As for the rest of us, we were left scrambling for crumbs. We simply did not merit such consideration. This arrangement seemed normal to people. Wealth bought privileges. College came after and it had its own particular set of teachings. They are the three C’s of liberalism: conformity, cynicism, and conservatism. To start, we were never taught directly about class. There was talk about the cultural politics of race, ethnicity, and gender. But we appeared to live in a classless society. There was the ubiquitous middle class but it turned out to be more of an ideology than anything else: a potent cocktail of individualism and objectivity. I came to identify more with those of wealth. If you looked the part, weren’t you one of them? I thought that selfishness could be rationalized. Isn’t it reasonable to look out for yourself? Then there was cynicism. I gained a very real sense that people were powerless to the forces around them. Effort didn’t make that much of a difference. Sure there were the great social movements of our time. But those had more to do with progress and civilization than agency. Weren’t civil rights and women’s rights inevitable? It certainly looked that way. The past did not have much of a connection to the present. History seemed to proceed without struggle. I stopped caring. Finally, there was conservatism. When Sir Thomas More wrote his monograph Utopia (1515), he would not take a side on what the idea of utopia actually meant. It could be either the Greek eutopia (the good place) or outopia (no place). Why the uncertainty? “More,” Lewis Mumford explained, “was a punster, in an age when the keenest minds delighted to play tricks with language, and when it was not always wise to speak too plainly.” The situation has not changed and, in the modern university, carefulness has become something both required and cumulative in its effects. I learned that idealism and romanticism were bad and should be reacted against. Realism and skepticism, however, were good and could be used as a cover for lack of engagement. “Words” should be put into quotes. The passive voice should be used. Language and ideas should be postmodern and kept purposely complex and obtuse. Knowledge itself seemed to be evolving ever more specialized and closed off. This takes us to Russell and the latest lesson. Why would he so rudely dismiss anyone as “an obscure semi-academic”? The answer is that the university remains a rigidly class-based institution—not only in what it teaches but also in how it operates. Russell himself has written about being a C student from the high schools in Berkeley and Oakland, who magically went on to attend two private schools: Antioch College and Columbia University. The first was best known for its rich hippy kids and the second continues to be known for just being rich. Only it was not magic that got him there; it was money. The recent New York Times article, “Top Colleges, Largely for the Elite,” continues with this well-trotted theme: undergraduate admissions at leading colleges and the gross inequalities that exist therein. For today, it is not enough that the children of wealth to attend the best funded primary and secondary schools with the smallest classes, most advance courses, and most diverse curriculum. Such students now get their own private college admissions counselors. They get $90 per hour tutors and test preparation workshops. They load up with extracurricular activities: Spacecamp, Earthwatch, Habitat for Humanity. The key is to impress the admissions boards and why not? It’s the golden ticket and the costs can be socialized. The top 100 research universities regularly give as much or more financial aid to families making over $100,000 a year than to those making less than $40,000. But the problem of inequality extends far beyond there, for it gets worse the further up the ladder of education you go. The American Historical Association released a related study in 2005 examining the quantitative trends in graduate schools for the social sciences and humanities. It found that, over the past 40 years, PhDs from these fields are “growing less diverse and more likely to draw from a narrow range of elite institutions.” Moreover, previous attendance at highly-selective, private liberal-arts schools—such as Williams, Bryn Mawr, Oberlin, Pomona, etc—plays a disproportionate role in the selection process for doctoral programs. In other words, not only do an ever growing number of PhDs come from the most exclusive universities, but these same students first attended the most exclusive colleges. The AHA’s concluding advice on the matter: “the beginnings of an academic career can play an important role in the way it ends.” About as political of a statement the organization could muster. But the AHA was right. The funnel of education narrows and compresses. Along the way, privilege becomes more important and potent, and merit comes to matter less and less. The anthropologist Franz Boas warned that “academic teachers are apt to consider themselves a privileged class in whose hands the development of university teaching and the advance of science rests.” Boas, who obtained his position at Columbia through his family’s connections, understood this well. He would join the Committee of Social Investigation at Greenwich House in order to help fund research for those outside of the university. But that was 100 years ago. Today, you get people like Professor X. Remember Professor X? He wrote that popular, anonymous piece, “In the Basement of the Ivory Tower,” for the Atlantic a few years ago. It argued without apology that some people should not attend college, for they are ill prepared for the intellectual rigors and it does not ultimately serve their interests. Who are these people? For Professor X, this meant adult education, nontraditional education, and education for returning students—in other words, education for the working class. It is a very good thing that he was never my teacher or I would have never finished my undergraduate degree. I was working class. I attended a junior college while working a second and third shift job. I bounced around various state schools. I was dyslexic and struggled mightily with my writing. Professor X would have given me an F and been done with it. I didn’t belong in college. Russell believes the same thing. He got his PhD from Columbia. I got my PhD from Toledo. He is significant. I am obscure. He is a professor. I am a semi-academic who teaches part-time ESL to immigrants. He has a literary agent and published his latest book through the Free Press. I had to often choose between grocery money for the month or coming up with the funds for the research of my book, and it would be published by Counterpunch and AK Press. Russell had to stoop low to review my book and he wants everyone to know it. The class divide is apparent. And it is beyond arrogance, self-entitlement, and exclusion. This divide is manufactured and corrupting. Professor X and Russell have come to outwardly speak for it. Many people quietly believe in it. Society is taught it. If you are poor, your only chance to make it and achieve your dreams is to get that rare scholarship to Amherst College. This is eugenics—the belief that class determines intelligence. The second of the social contracts that I broke has to do with species and class. 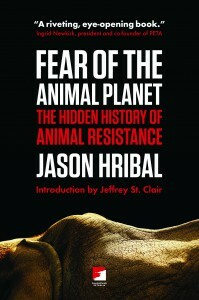 My book, Fear of the Animal Planet, chronicles the actions of captive animals. It considers the context in which those actions happened and the consequences that resulted, and it makes interpretations. This is what historians do. Yet, according to Russell, this is not allowed. Animals may have actions but those actions are not open to interpretation. The thoughts of other creatures cannot be known. Any attempt towards such a direction will result in the erroneous imposition of consciousness upon the subjects. It is to become a ventriloquist for the powerless. Many people would agree with Russell’s assessment. I would have too but not for a fundamental change that occurred in my thinking several years ago. Towards the close of my master’s degree, I had become indoctrinated by the teachings of liberalism. I was conformist, nihilistic, and timid in my thought. I would have never believed that animals could resist. Yet I had reached a point where I had finally begun to do some thinking on my own and I knew I was headed in the wrong direction. Sure it was the direction where everyone else was going; nor could I, at the time, have told you why it was wrong. What I needed was a significant and demanding intellectual overhaul. I started looking for help and ended up turning to the historian Peter Linebaugh. My overall knowledge of history as a discipline was meager, as I studied anthropology. But I had read enough to understand that history from below was fundamentally different. It was perhaps more influential outside the university than it was inside. It was imaginative, optimistic, and not afraid to take on a challenge. Many professors seemed genuinely frightened of it. That was a good sign. The world needed to be turned upside down. The initial journey was not without its bumps. There was a good deal of learning to be done and I had a lot of images to erase. I remember when I first arrived to Toledo a small group of us met weekly to discuss the early drafts of the Many Headed Hydra. One night, while considering the first chapter, “The Wreck of the Sea Venture,” I accused its author of being idealistic in his views of Algonquian culture. He understood what I meant and a row ensued. But I eventually figured it out. Utopia wasn’t no place; it was the good place. My interest into the history of animals began as a complete accident. I needed a topic for a first-year graduate seminar. The Toledo Zoo was local and there were plentiful primary sources. That was the only reason I chose to write about it. I had no interest in animals at the time. I was not an animal lover. I did not believe in animal rights. At best, I was indifferent towards the abilities of other animals. At worse, I was negative. Could animals even have a history? No way. The project began as a history exploring the early years of the zoo and its administrators. The animals themselves were to play a part in the story but only in a passive role. How would they do anything different? As my research expanded, however, I began noticing things that did not fit. Some captive animals were escaping. Others were attacking their trainers. And it was not just a few isolated cases. This was happening with frequency and patterns. I began asking questions. Animals do not magically appear in the zoo. How do they get there? Why do zoos take the young and not the older? What are the training methods? What are the conditions of daily life? What are the social relationships within the institutions? What are the consequences of those aggressive actions? My conventional history was falling apart, as were all of my ideas concerning other animals. It would take another decade to fully answer each of those questions and the end result was Fear of the Animal Planet. My argument is basic and straightforward. Captive animals are resisting. They are resisting the way they are taken, held, trained, and worked. They act with intent to make space for their own wants. They shape their social relations and alter human structures. Each of their actions leads to a consequence: good or bad, short-term or long-term. Captive animals are making history. This narrative can be difficult for people to wrap their heads around because it challenges our paradigm. Russell, for instance, has trouble understanding many things. How could I ever connect words like exploitation, struggle, and autonomy to other animals, he asks? The reason is because those words express a very real, empirical relationship that exists within zoos and circuses. I use exploitation because these institutions are seeking power, control, and profit. I use struggle because there are two sides to this relationship. Captive animals are neither inert nor passive. They assert their wishes and attempt to control the various situations they find themselves in the best way they can. This is the seeking of autonomy. What is freedom if not the ability, however limited, to shape and guide your own destiny? Russell wonders how I could claim to know the reasons behind Tyke the elephant’s rampage and death in Honolulu in August of 1994. In the court of law, motivation and precedence are essential in proving your case and with Tyke we have both. She had to endure 20 years of contract work and constant travel in poor, cramped conditions. She would have been chained for more hours of her life than not. She would have been beaten regularly with a bullhook from the time she was young. Her particular company, Hawthorn, had been fined repeatedly for not providing adequate medical care to its elephants. Several of the company’s elephants would die because of this lack of care. This is the reality of the circus industry. It is how it operates and accumulates. Tyke had to live this life and it provided her motivation. As for precedent, there were related incidents leading up to the fatal one in Honolulu. Tyke had escaped during a show in Pennsylvania in April of 1993. Police wanted to shoot her straightaway but she would be brought under control. Two months later, she attacked a groom and sprinted into the midway of the state fairgrounds in North Dakota. The man said afterwards: “the elephant was definitely trying to kill me.” These incidents matter because they represent a pattern—a pattern not uncommon among captive animals. There will be a slow build up of events that can, if ignored, ultimately lead to a stunning finality. This is what happened with Tyke. It might be tempting to dismiss Russell’s objections and criticisms as being solely about species and the belief in human superiority. But that would be a mistake, as Russell makes it clear “that translating the revolutionary consciousness of voiceless animals is no more silly than doing the same thing for human beings.” He is against all of social history—whether it is about elephants or humans. This might seem strange considering that Russell just wrote a book called Renegade History of the United States, which contends that slaves, pirates, prostitutes, and delinquents expanded freedom by doing what they were not suppose to. How could Russell, who promotes himself as a bottom-up historian, be against bottom-up history? The answer is liberalism. Russell emphasizes conformity. He states that the majority of captive animals, like humans in general, do not resist. This is the most important fact to him. I take the opposite view. I look at the context in which this conformity is created—from captivity, to indoctrination and training, to punishment—and I am amazed that resistance occurs as much as it does. When a gorilla escapes from her enclosure, my focus is not on whether she later returns willingly to her cage, but rather on the fact that she ever escaped in the first place. Russell believes in voicelessness. He cracks a joke at the start of his review that my book proposes an argument “that will make anyone other than the fiercest PETA activist smirk.” But this is not funny. For a long while, the majority of animal-rights supporters did smirk at my ideas. They thought I was nuts for proposing that animals had agency and could resist. This view has begun to change, but some still do not get it. How could self-proclaimed animal-lovers have been so opposed to such possibilities? The same reason as Russell, because they were taught to think so. In the university, animals are portrayed as the pejorative, the subaltern, the other. They may have emotions and intellect but they can never have the ability to actively shape the human world around them. Animals have to be powerless. To do otherwise would invert the entire social order—both in terms of species and class. Russell is certain that social historians are imperialistic and impose political consciousness upon those populations who have none. But again he has it backwards. It was Tyke, Tatiana the tiger, and Tilikum the orca who imposed a consciousness upon me. Their individual actions had broad ramifications that became politicized. This forced me to consider the context, confront issues, and make changes in my thinking. This is inductive reasoning. I did not need to get into their minds nor have an understanding of their language to do this. Actions can speak louder than words. Tyke, Tatiana, and Tilikum converted me. I am now on their side.